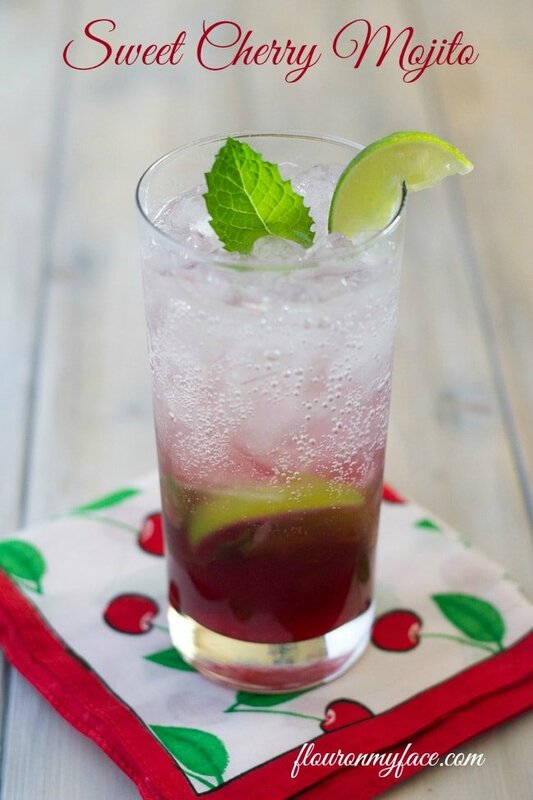 I can’t think of a better way to start out the week than to share this Sweet Cherry Mojito recipe. I have been enjoying some delicious Mojito recipes this summer. 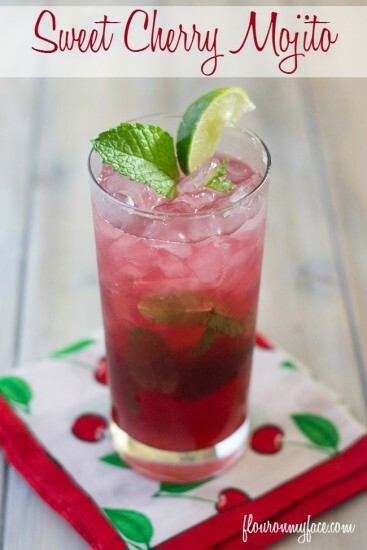 This Sweet Cherry Mojito is a perfect fruity poolside cocktail or to relax with on a hot summer evening as you unwind. No matter what time of day or occasion you sip on this Cherry Mojito recipe it is going to become your favorite mojito recipe! To make a Sweet Cherry Mojito, you are first going to have to make a sweet cherry simple syrup. Making a fruit flavored simple syrup is very easy to do. Once you have mastered one fruit flavored simple syrup you will be able to use the same method to make pretty much any flavor of simple syrup there is. Then you are going to become a simple syrup making ninja and make all different types of cocktail recipes, different fruit flavored mojito recipes and even homemade soda recipes. Stir well until the cherries start to release their juice and the sugar starts to dissolve, about 15 minutes. Add water. Heat the cherries, water and sugar on low for about 15 minutes until the sugar is completely dissolved. Stir occasionally. Then turn the heat up to medium and bring to a low boil. Strain over a fine mesh strainer to remove the solids. Using a muddler muddle the mint and lime wedges in a tall glass. Add 1 oz Bacardi light rum, 3 oz sweet cherry simple syrup and top off glass with chilled club soda. Add 1 oz Bacardi light rum, 3 oz cherry simple syrup and top off the glass with chilled club soda. Want more fruity Mojito recipes. Then check out my other Mojito recipes below. This looks delicious and I can’t wait to try it. We’re sharing your post on our Sunday weekend features article with a link back to you. We pin and tweet all of our features and can let you know when the post goes live if you’d like to share on social media as well. It is awesome. You’ve got to try the recipe. Yum! I love mojitos and I love cherries, so I think I’ll love this. Can’t wait to kick back on a hot August night with one. Thanks for sharing! Becky I hope you get a chance to try the recipe. It is delish! Loving how this mojito looks, and how easy it would be to change the flavor just by changing the syrup! Such a refreshing drink. 🙂 I hope you can stop on by and share this or any other recipe with us on Five Friday Finds! I am a bit Mojito obsessed this summer, as you can see but yes it is so easy to change the fruity flavor of a mojito by using a different flavor simple syrup. NOW I know what to do with all my mint! I love mojitos! Thank you so much for sharing this refreshing recipe with as at the Inspire Me Mondays Link-Up! Thank you! I hope you have a chance to try the recipe! Thank you. I hope you enjoy the recipe! I love a good Mojito! Thanks for sharing with the #homemattersparty. We are have the most creative guests this week! Thank you so much. Enjoy if you get the chance to try the recipe!